Invisible Analysis: CHINA GROWTH PLANS FOR 2010. 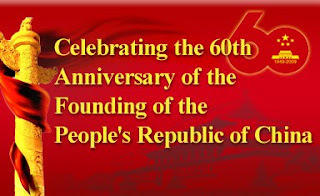 China is celebrating its 60th Anniversary of the Founding of the People's Republic of China. But there is something more to celebrate. China's manufacturing expanded in September for a sixth month and employment rose at its fastest rate in two years, indicating a recovery in the world's third-largest economy is on track. Employment in China grew at its fastest rate in 25 months, which suggest that China's recovery, fuelled by heavy government spending on public works construction, is spreading to the consumer sector. The ultimate fruits are now coming out of spending the stimulus declared by China. China's industrial output rose 8.1% in the first eight months from the same period last year driven by Beijing's 4 trillion yuan ($586 billion) stimulus. In August alone, China's industrial output expanded 12.3 percent year on year. The growth rate was the largest since September last year when the global economic slowdown hit China. The Stimulus measure have also fuelled the thought that the companies might be running too fast and overcapacity is slowing building up. This will give birth to more threats in coming days. The govt is also very concerned over this and might see some measures to put brakes on such high fast growth. Significant growth is being found in Chemical, Automobile, Cement etc. Various new projects are being started off resulting to higher employment. But on the other hand export of China have taken a huge set back. China's exports in August dropped 23.4% year on year, indicating the country faced a tough exports situation. The major reasons behind such a fall is primarily due to the low consumption of US economy. As we all know US remains the highest port of exported goods from China. In the coming days we will find huge investments and manufacturing operation particularly focusing on Real Estate. The government is preparing to set up a special department. The new department will be responsible for developing programs, building housing and guaranteeing that policies are carried out. So more investments and more employment creation will happen at China. The steel sector and cement will largely benefited.China is also taking huge initiatives for small-and medium-sized enterprises (SMEs). the government will optimize its procurement mechanism, raising the purchase proportion of commodities, engineering and services from the SMEs. It will expand channels for the SMEs to raise capital through encouraging banks to lend more to the SMEs, stepping up making policies to guide private capital to tap into the country's financial system. The government will increase tax breaks to the small firms with an annual taxable income below 30,000 yuan (4392.4 U.S. dollars) from Jan. 1 to Dec. 31 of 2010. So its well clear the China economy is on a roller coaster ride and will remain out of any trouble of Western Countries economy. China has made timely adjustment to the direction of its macroeconomic policy, swiftly adopted a proactive fiscal policy and a moderately easy monetary policy. China's economy is in good shape on the whole. They have planned for growth ahead for 2010.So Lot of positive flows will keep the Asian economy out of any major Bad Weather. China have kept the Asian Tower of Economy firmly with its various policies .This have also directly or indirectly kept other Asian countries Alive despite of several Western Hurricanes. So India and other Asian countries are also going to benefit from the plans of China.